I don't think I've always concentrate on sides enough, which means our main dish is often served with a steamed vegetable & perhaps a starch like potato or rice. There is nothing wrong with that but I'd like to add a little more interest to the whole meal. Since we've been getting more varied fresh vegetables this summer it seems like a good time to work on that problem. When I wrote about our last CSA box an anonymous commenter suggested I try Kale Chips & gave a quick how-to. We were very intrigued & since they only take 15-20 minutes from start to finish I decided to make some to serve for lunch today instead of potato chips. The result was a thin, crunchy almost lace-like chip. The flavor of the kale was very subtle with a hint of nuttiness. I added quite a bit of salt which made it seem like a guilty snack. They didn't go soggy after cooling at all, which I was worried about after my sad little try at Beet Chips. I really, really liked these. Matt, on the other hand, is not sold but he couldn't pinpoint why. After making these I looked to see if there are recipes online & there seems to be one main on floating around that adds cider vinegar. I guess that would make a salt & vinegar version as compared to my salt & pepper. Maybe I'll try those tomorrow & see if they go over better. Matt read you could serve these with a dip but I think they are much too fragile. I'd like to try them as a garnish on a salad or soup, a beautiful crunchy addition. 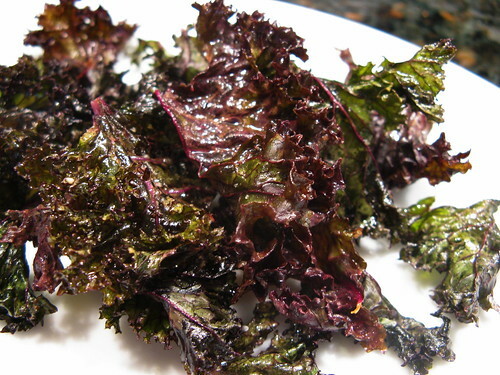 Preheat oven to 350 F. Clean & dry your kale leaves (I use a salad spinner). Toss them with the olive oil making sure to coat all the leaves (add a little more olive oil if needed, I used 1 T & it was probably too much as they came out a little greasy). Mix in salt & pepper to taste. Spread leaves out in a single layer on a baking sheet covered with a silicone mat or parchment paper (I sprinkled a little extra salt on at this point). Bake for 10 - 15 minutes until crispy (mine took 11 minutes). Update 7/22: I made these chips again today & used 1/2 T olive oil & 1/2 T cider vinegar. The addition of the vinegar flavor really does give them a nice tang. I think I'll keep adding it in the future. We've been looking for a good creamy coleslaw recipe & so far everything we've tried has been bland, bland, bland. We got two red kohlrabi from the farm so we decided to try again. Matt suggested we try Alton Brown's Celery Remoulade recipe replacing the celeriac with kohlrabi. (Ok, I know remoulade is technically a sauce but that is was Alton called this salad.) It was perfect! The creme fresh adds a subtle tang, the Dijon a little sharpness & lemon freshens the whole thing up. It's so simple in its ingredients & preparation I think we have found our go-to coleslaw. Mix the lemon juice, mustard, & creme fresh together in a medium bowl. 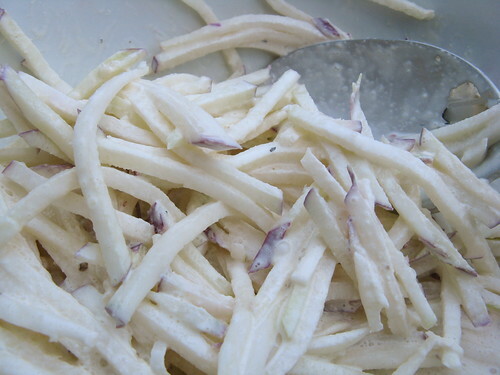 Slice the kohlrabi into matchstick-sized pieces and add to the dressing. Salt & pepper to taste. Cover & allow to chill for 1 to 3 hours before serving. Now that's going out on a limb...trying out a suggestion from anonymous reader of your blog! The greens look like seaweed and they look yummy and you're selling me on kohlrabi...I have kohlrabi block. Kale chips, I never would have thought of that. How creative! And roasting anything is always yummy, since it brings out any sugars. I bet you that, if I were to make this, Do would respond like Matt. Probably because he'll be thinking chip thoughts and getting something greener and healthier. It probably won't be as satisfying. Maybe if we try to rename it something different, like roasted Kale or something that doesn't evoke Pringles thoughts. BTW, didn't you used to live in SF? i LOVE kale chips! and i agree that i can't really explain why. they don't really have much taste, besides what you season them with, but they have such a great, unusual, crispy texture. Kale chips are great! I keep meaning to try them with something, but end up eating them all before the something is ready. I grilled some romaine today but the crispy kale...hmmm....I'll just wait and see what you come up with the salt & vinegar on it. I bought Artisan Bread in Five Minutes, today. I'm in love with making bread all day long now. Thanks for the great 'side' ideas Kat. I totally know the feeling of concentrating so much on one element of dinner that the others turn out a bit boring. When we get kale and kohlrabi from our CSA I'll be trying these out.